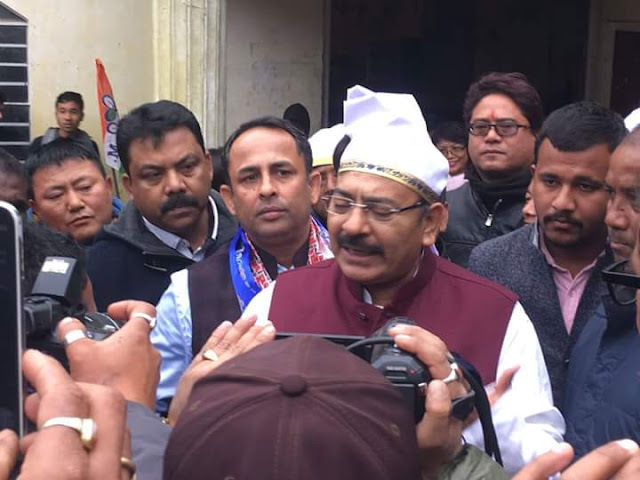 Two leaders of the Gorkha Janmukti Morcha have joined the Trinamul Congress as minister Aroop Biswas started the tour of the Darjeeling hills to prepare the ruling party for elections to four municipalities in the region. While former vice-chairperson of Kurseong municipality Kalpana Pradhan joined Trinamul on Sunday, L.B. Rai, a former chairman of Mirik municipality and a vice-president of the Morcha, shifted his allegiance to the ruling party yesterday. Yesterday, a group of 40 Morcha workers from Darjeeling subdivision had also switched to Trinamul. "Several prominent leaders (of the Morcha) have joined our party and more will follow them soon. This is because they (Morcha) have only made empty promises and could not deliver basic civic services to the hill people in the past five years. Local people could not find elected civic representatives in their areas even a few weeks back. With the municipal elections drawing near, these people have started visiting the localities," Biswas said yesterday. He has been touring the hills since Sunday to oversee Trinamul's preparations for the elections to Darjeeling, Kalimpong, Kurseong and Mirik municipalities. As the civic polls are drawing near in the hills, Trinamul is putting all possible efforts to establish itself as the principal rival of the Morcha. Trinamul is expected to get another boost when chief minister Mamata Banerjee would visit north Bengal later this month and declare Mirik subdivision. It has been a long-standing demand of the people in the tiny hamlet of Mirik and the adjoining areas.